Default restore scope for users with non-administrative role includes All machines from available backups. 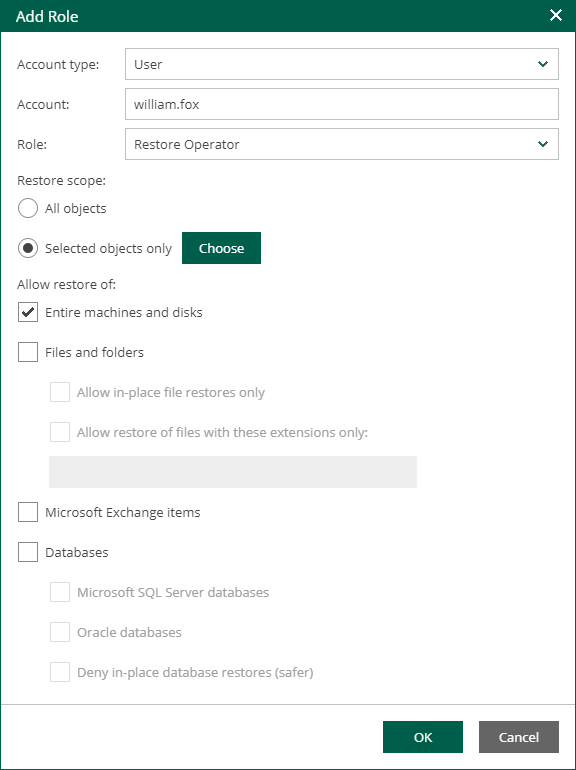 If you have Enterprise Plus edition of Veeam Backup & Replication deployed in your environment, you can customize restore scope for non-administrative users. Use the Selected machines only option, and click the Choose button. In the Manage scope objects dialog, click Add object and select what objects to display: Hyper-V, vSphere, vCloud or Protection Groups. 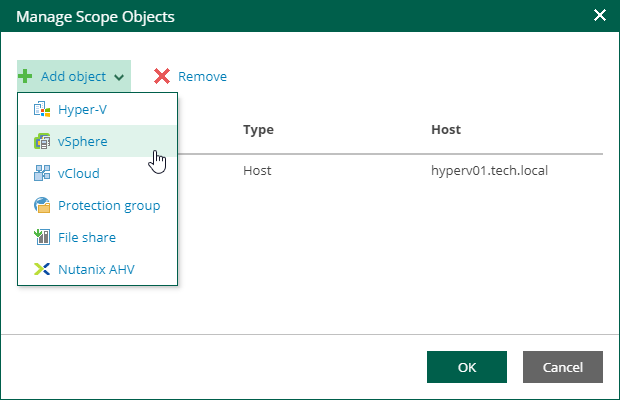 For VMware objects, you can switch between Hosts and Clusters, VMs and Templates, Datastores and VMs and Tags and VMs views. For Hyper-V objects, you can switch between Hosts and VMs, Hosts and Volumes, Hosts and VM Groups views. 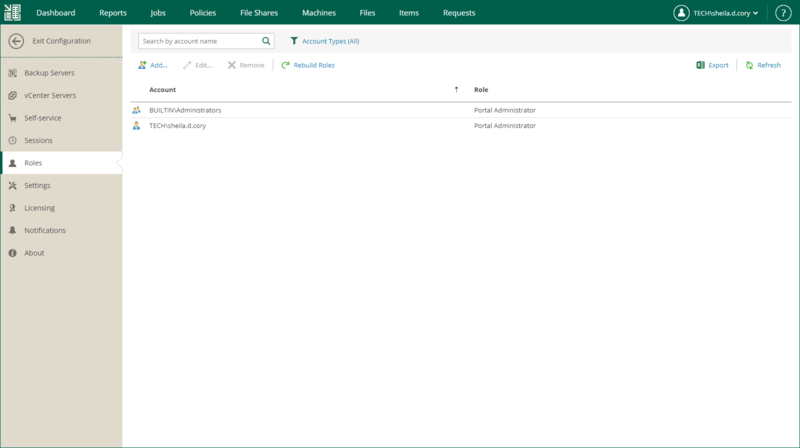 Users then will be able to view the machines and/or files included in their scope on the corresponding tabs after they log in to Enterprise Manager. The Machines tab displays only machines that have been backed up, and Files tab displays guest OS files only for machines that have been backed up with guest file indexing enabled. For more information on indexing, see Preparing for File Browsing and Searching. Restore scope is automatically refreshed daily on built-in schedule and also after any role modification. 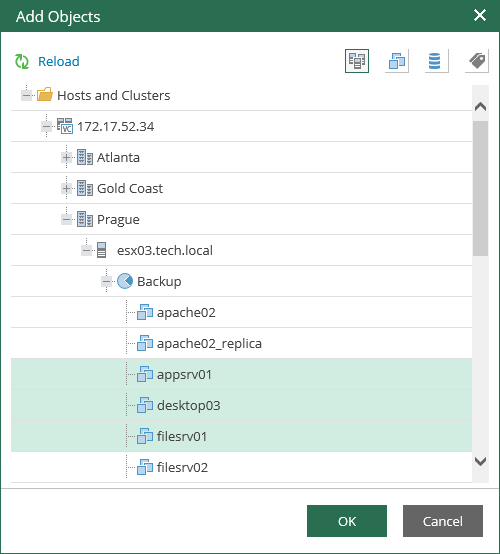 It may happen that some newly created machines and backups are not yet presented to users in the Machines or Files tab right after the login to Enterprise Manager. If you can not find a VM after making a search query, click the link I don’t see my VM to refresh the view. This link, however, will not be visible until you have made an unsuccessful search. Administrative user can refresh all scopes of all accounts manually — for that, in the Roles section of Configuration page, click Rebuild roles. However, consider that this operation will affect all configured roles. Portal Administrators can watch the progress of security scope rebuild process on the Sessions page.